You can click on the red 'Add website with Google Analytics' button. This will open a popup (make sure your browser doesn't block the popup!) that will redirect you to Google. From there, you can sign in to the desired Google Analytics account, and choose a website from your Google Analytics account that you would like to use with Snitcher. If for some reason you don't have access to the desired Google Analytics account, you can ask a colleague how does have access to complete this step for you. You can copy the link that was generated, and send that to your colleague. They will be able to complete the Google Analytics setup process for you, but they will not receive access to your Snitcher account. This will assume that you have access to the desired Google Analytics profile. After clicking 'Add Website', a popup will open (make sure your browser doesn't block the popup!) that will redirect you to Google. 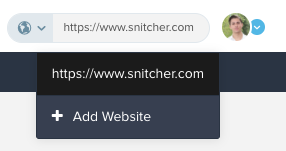 From there, you can sign in to the desired Google Analytics account, and choose a website from your Google Analytics account that you would like to add to Snitcher.